1. Lean grass fed beef leaves very little margin for overcooking. Cook it past "medium" and you've probably dried it out. Grass fed beef, younger than 18 to 24 months, is very tender but generally very lean and it possesses very little intramuscular fat (IMF). The IMF found in grain fed beef and older grass fed animals releases moisture into the meat during the cooking process, thereby leaving a margin of error for over cooking. But without this safety-cushion, one has to be very careful not to dry out lean beef. 2. When you buy directly from a farm, you generally agree to buy a 1/2 or a 1/4 of an entire animal. Receiving a freezer full of direct-from-the-farm natural beef is pure bliss. Dive into the freezer and come out with any cut of meat you could ever want! But if you dive into the freezer every evening, and pull out only premium cuts of steak, you'll soon find you have no steaks left! Hamburger will hold you over into the grilling season, until at some point you find only roasts in the freezer. We've all been there. This is where the "tip roast" comes into play. Using this recipe, you can transmute "roast" into "steak" and keep the grill going long after the burgers and steaks have disappeared from your freezer. It will also impart an extra degree of moisture to the meat that will let you finish the meat to "medium well" for your guests that refuse to eat natural beef as it should be enjoyed (medium rare!). Thaw the cut labeled "tip roast" or "sirloin tip roast." Don't even think about using the microwave unless you really want to ruin the meat. The last processor we used wrapped our cuts with three layers of wax paper, so I remove all all but the last layer and leave the roast in the fridge for a day on a dish that will catch the juices. (BTW, as the roast thaws, it will cool your food in the fridge, saving you an infinitesimal amount of electric on your next bill!) If your packager seals these cuts in plastic, you could soak the whole package in water for even quicker thawing. Cut the roast into cubes about 1.5" on a side. If the roast is 90% thawed but still a wee bit frozen, it will actually be easier to cut. As the tips soak in the marinade, they'll have time to thaw completely. Make a marinade. You can be creative, but the essential ingredient is vinegar. I suggest wine vinegar or some other natural vinegar, but not common white vinegar. Wouldn't it defeat the purpose of buying natural beef to smother it in a petroleum extract? If you're short on time or not feeling particularly adventuresome, use your favorite Italian salad dressing. Otherwise, mix the natural vinegar with olive oil, and add mustard seeds (these are really good), garlic (dried or fresh), minced onions, peppers (sweet or not-too-hot), black pepper, and celery seeds. Last week, just for kicks, I added some dried Chanterelle mushrooms, and was pleasantly surprised with the flavor they contributed. Mix the "steak tips" in the marinade and let sit in your fridge for at least another day. If you make up twice as many tips as you need, you can have another meal a few days later after the marinated has permeated the tips even more. No one at our house has ever complained about eating this dish twice in one week! After at least 24 hours of soak time, Grill! Over wood or charcoal is obviously the best. But if you're under the gun, or weather doesn't permit firing up the grill, try the broiler on your oven - that's how I cooked these. I suggest cooking these only to medium rare, but my wife prefers medium, and some guests prefer medium well. Just remember, as small as they are, they'll cook even faster than steaks, and as with all meat, it will still be cooking inside in the minutes after being removed from the heat source. Please let me know if you try this dish or have a different variation for us to try. In the middle ages, they tried to turn Lead into Gold, with no good results as far as I know, but the process here is guaranteed to turn "tip roast" into "steak." Although I've never tried it with supermarket "tip roast," I don't see any reason why it wouldn't work for that too! Most cattle farms in Kentucky are "cow-calf" operations. By this I mean, the farms usually keep only stock cows (mature female cattle), and each of these cows, if everything goes well, gives birth to one calf each year. The calf leads an idyllic existence for the first 6 to 9 months of its life, nursing its mother and picking at fresh grass and hay in wide open pastures. When the calf is old enough, it is weaned from its mother and taken to a local stockyard where it is auctioned by the pound. The picture at left shows two of my Wagyu cows and one of my Charolais cows taking it easy with their calves in the field. Notice the bluegrass in the background?! The buyers at auction carefully group the calves according to weight, load them on train cars and semi's, and send them to live out the rest of their lives on feedlots in the Midwestern states like Nebraska, Iowa, and Kansas. Most of the animals sold at market in Kentucky are calves weighing less than 700 pounds. Cow calf operations in Kentucky can be small affairs (less than 10 cattle), but the feedlots in the Midwest are often large scale operations. (see the stock photo at right). (1) Cows are not like pigs and chicken - they simply don't reproduce well in confined areas. Fertility rates are low and mortality rates are high when cattle are penned up. They are built to roam, especially when it comes to reproducing. A lot of the flat space out west is devoted to raising corn, not to grazing cattle. 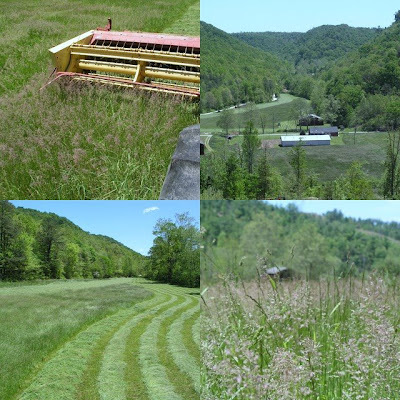 Much of our land in Kentucky is hilly and broken up - ill suited for corn, but fine for raising young calves. (2) Anti-monopoly rules still forbid the seed/feed conglomerates from owning the beef production process from start to finish. (unlike the poultry and pork process which they have pretty much cornered) The corporations are chipping away at the restrictions, but for the time being, they are not allowed to own this cow-calf part of the process. (3) Finally, it's not very profitable to raise calves from birth to weaning age! This I have deduced on my own. As long as small farms are willing to raise enough calves at or below their cost, why should the corporate farms want to own this part of the process? From my observations, the economics of raising beef cattle in Kentucky are dismal at best. Five hundred pound calves bring roughly $500 at the market, and you will have roughly $500 invested in that animal if you ignore the opportunity cost of your land! Fellow farmers sometimes tell me that they make money at it, but I don't see any of these farmers buying or leasing more land to expand their operations. (beyond what their day job can finance!) Case closed. So that's the status quo. Calves are born in Kentucky and fattened up in the Midwest. There's no profit in raising cattle in Kentucky if you follow the current model, but I like raising cattle and my land is suited for it so what am I to do? Change the model! Rather than sell calves to market, as we've done on this farm for almost 50 years, I've been selling several of our calves directly to consumers who recognize the benefits of buying directly from a small well managed farm. The photo at left shows how the composition of my cow-calf operation has evolved in the past year. From left to right you can see (1) a yearling steer being finished on grass, (2) my Wagyu bull who will soon be the father of all the calves born here, (3) a short fat Red Angus cow responding to the bull's romantic overtures, and (4) the calf of the red Angus cow (her father was a registered Black Angus bull). What's different in this picture from the old model? Well, there's a yearling steer being raised for direct sale to consumers - that's different. Also, there's a scrawny Japanese bull getting ready to breed that British cow! Now that I'm selling beef, not calves, I have a vested interested in improving the genetics of my calves beyond the conventional metric of "weaning weight." It's the quality of beef that we can put on the plate that matters most now. After tons of research, lots of phone calls, some seriously good taste testing (in Japan and the US), and two trips to a Wagyu breeder, my wife and I decided to take the plunge and buy some purebred Wagyu cattle for our farm. It would have been nice to sell my existing herd and buy an entire herd of Wagyu cattle, but at the then going rate of $4,000 per animal (2007 prices), that simply wasn't feasible. Instead we initially bought one bull and one three year old cow from Vic Luneborg of Clear Creek Farms in Ohio. Vic is the most established Wagyu breeder east of the Mississippi and he runs a very nice operation. His focus is strictly on breeding stock (as opposed to beef production) but he has all of his cattle tested for the genetic markers that indicate tenderness and marbling, and he breeds for these traits. In this first picture, you can see my father-in-law (he has raised cattle longer than I've been alive) and my son, anxiously awaiting the release of the first two Wagyu from Vic's trailer into our pasture. This next photograph shows Vic and my father-in-law watching Kakujitsu, the 18 month old bull, getting ready to step out of the trailer. This bull will be the father of all of the calves born on this farm for at least the next two years. Wagyu cattle were first established in the US through the importation and subsequent cross breeding of 4 Japanese bulls to domestic cattle. The first offspring born in the United States were of course 50% wagyu, and each following generation was bred to one of the 100% bulls to gradually increase the wagyu percentages to 75%, 87,5%, 93.75%, and so on. By acquiring a new Wagyu bull every two years, I can use a similar breeding strategy to develop a herd of purebred Wagyu here on my farm. This is the pedigree for Kakujitsu. 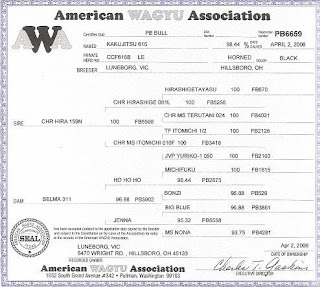 Kakujitsu is 98.44% Wagyu which means he qualifies as a purebred Wagyu and all of his offspring will be considered 50% wagyu under the American Wagyu Association rules. (15/16ths or 93.75% is deemed purebred) Developing an entire herd this way will be a long process (more than 10 years), and the current interest in Wagyu cattle could wane by then, or perhaps they will be as common as Angus are now. In any event, to hedge my bets and get a jump start on my purebred herd I bought a high percentage Wagyu cow from Vic as well. She was delivered at the same time as Kakujitsu (Fall 2007), expecting a calf in April of 2008. This is a picture of Missy, the young Wagyu cow that came with Kakujitsu. Her percentage (90.625%) does not earn her the vaulted status of "purebred," but as long as she is bred to a bull of 98% or greater, all of her offspring will qualify as purebred Wagyu. A few months after acquiring Missy, I purchased two more Wagyu cows from Vic. Here's a picture of those cows, Bailey Two (foreground) and April Sunshine (background), in the summer of 2008, with their slick summer coats on. All three Wagyu cows gave birth to healthy wagyu calves this past spring (2008), so our herd of Wagyu cattle numbers 7 today (3 cows, 3 calves, and one bull). Whats more, some of our original cows have already given birth to 50% wagyu calves, so the herd is starting to take shape!